You guys. I have so much to talk about. I know I've been kinda quiet lately... it's because I got a new job! I may have alluded to some unhappiness at work in the past, and this was totally the right move. I now work at a local car dealership as the internet marketing director for the 3 dealerships that are all on the same property. I am responsible for photographing and putting descriptions up of ALL new and used cars. To give you an idea of how large this company is, the owner has about 50 or so dealerships in the greater Boston and Providence areas. The dealerships run the gamut, from Ford and Honda to BMW and Rolls Royce and everything in between. It's only been a few weeks, but so far, I LOVE it. Surprisingly, even though I have about 400+ new cars that I need to get photographed and online, the job is way less stress than my last one. People are treating me the way I want and deserve to be treated and seem genuinely happy to have me on board. Also, I get to use my education (imagine that!) and have minimal interactions with customers (pretty much just a smile and a friendly hello when I see them in the show room). Also, there's way more upward growth potential at this job. Overall, I'm thrilled. So. Thanksgiving just passed and we are in the midst of Chanukah. I have done a TON of baking this past week for the holidays, and have much to show you. I thought it would be overwhelming if I did it all once, though, so I'm breaking them down into different posts. 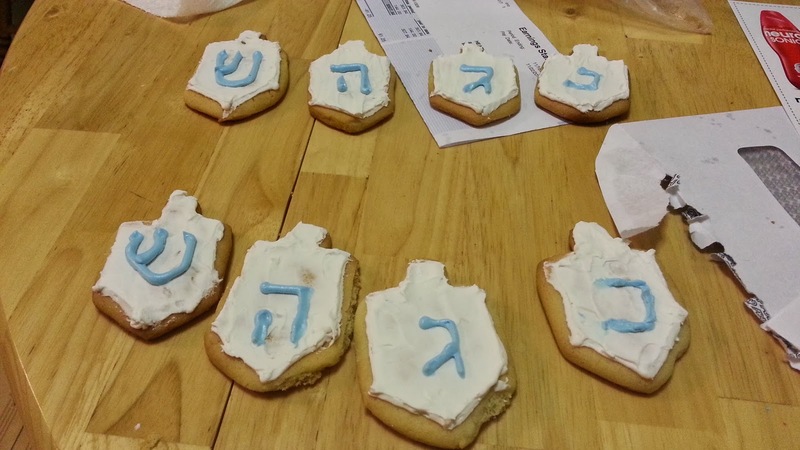 I was originally going to do it in the order of which the things were made, but, obviously, Chanukah cookies are relevant and I wanted to share those first. 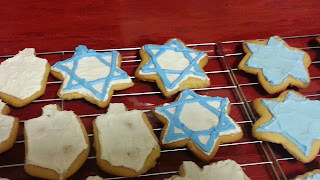 Also, considering my pretty terrible decorating ability, I'm the most proud of these and wanted to show them off! Since it's just a basic sugar cookie recipe, this also seemed the most timely so that you can plan to make them for Christmas. 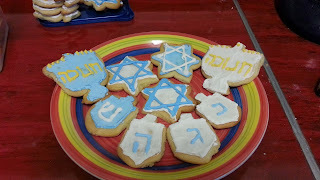 Before you ask: I have no idea where to go to acquire Jewish themed cookie cutters. I figured if anyone would have them, it would be mom. She did, so now I do. If you're looking for some so you can make your own, Amazon seems like it's probably a safe bet (side note: I just checked while I was typing this. Definitely check Amazon.). The cookie recipe itself is actually something I've had since high school. In my freshman year english class we had to do a "how to" demonstration. Obviously, the girl couldn't fully demonstrate how to make cookies, but she brought the recipe with some samples! Now, this is not designed to be an actual roll out cookie dough recipe, but I did all of the research for you and you can turn pretty much any sugar cookie recipe into one! All you really have to do is chill the dough so that it stiffens to the correct consistency. You can also add more flour, but this recipe is pretty similar to a lot of the ones that I found floating around on the interwebz. I chilled my dough for about 10 minutes, but you'll want to chill yours for longer. Some of my cookies softened around the edges instead of staying in the precise shape they were in when they started. For me, this was no big deal. If you're making these with kids, it's probably no big deal either. After I noticed that it was happening when I checked on the first batch, I stuck the other sheets in the fridge to chill after they were cut and before they went in the oven. This helped out some, but chilling the dough for longer ahead of time is probably the right thing to do. The trick is to make sure you don't chill it for TOO long - I would think that about 30 minutes to an hour is good enough, because you still need the dough soft enough to work with. I worked with about 1/3 of the dough at a time, and probably could have left the rest of it in the fridge. I love sugar cookies with frosting, but transporting them the few blocks to my mom's house with buttercream frosting seemed like it posed some problems. I've read about royal icing about a million times on the internet, but never had the opportunity or a reason to try it. Once I started investigating, my main concern was the (uncooked) egg whites called for in most traditional recipes. I was pretty sure that most everybody would be okay, but my gramma is 81 years old and I'm not knowingly going to take any chances with that woman. I made mine with meringue powder instead, which is made of dried egg whites, sugar, and gum. I had to go to Walmart (my nemesis) to get it, but I was able to find it pretty easily once I could figure out where the cake decorating/Wilton section was. 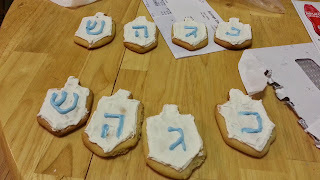 After reading about 20 blogs about royal icing, I was prepared for a battle. I was expecting it to be much more difficult than it really was. The hardest part, for me, was getting the icing to the right "flood" consistency, but I think that was really because I was bound and determined to make only one batch and split it up from there, rather than making multiple batches and then wondering the the heck to do with the leftovers. I ended up having to use my (clean!) fingers to spread the icing on some of the smaller cookies, but it definitely worked well. I was a little wary about leaving my cookies out overnight, and while I ended up with a crunchier cookie in the end, none of the bad things I imagined ended up happening. This exercise made me realize how much of a perfectionist I can be. For me, I was originally unhappy about the cookies losing a little of their shape in the oven. Then, I was like "man I could have decorated these much better!". Then, I called Joe into the room when I was finished and he thought they were awesome. Then, I brought the cookies to my mom's house and made a whole huge thing about keeping them a surprise and not showing them until it was time to eat dessert. And suddenly, it didn't matter that it took me a couple of days to make these or that I thought the results could have been better. Wanna know why? My family LOVED these cookies - I hope your family does, too! Combine all ingredients. Dough will be thick. Cover and refrigerate for about one hour. Preheat oven to 375°F. Roll out to about 1/4" thick and cut cookies as desired. Bake for 8 minutes or until edges are just starting to turn golden. In the bowl of a stand mixer fitted with the paddle attachment, combine meringue powder and powdered sugar. Add water and beat on medium-high speed until stiff peaks form, about 5-7 minutes. Add water or sugar as needed to achieve correct consistency.